"As the court’s royal dog, Caesar has stayed by Mercia’s side since childhood, guarding her at all costs." Caesar is a commander in the Cherrystone Kingdom. He is the pet of Queen Mercia, and is attended by the royal guards Horatio and Beatrice. 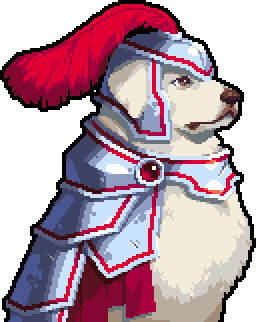 Despite being a dog, Caesar has managed to create an incredible air of authority and dignity around him, so much so that he is able to command whole armies to defend the Cherrystone Kingdom. A magnificent and majestic canine, Caesar leads armies with wordless dignity. His mere presence is enough to inspire and guide troops through battle. Caesar was born in a litter of three, on the summer solstice. Each pup was promised to the youngest child of a noble family. While each of Caesar's sisters were homed far across the seas, Caesar remained in Cherrystone. He is Mercia's much beloved pet and best friend. Caesar's closest companions outside the royal household are his crossbow-wielding personal guards, Horatio and Beatrice. As well as protecting Caesar on the battlefield they also provide mid-combat belly rubs and ear scratches, as required. Caesar's Groove is Inspire, which allows all adjacent units to act again this turn. Inspire is great for pushing an attack. The groove works particularly well in conjunction with siege units, allowing them to move and attack in the same turn. This page was last modified on 24 March 2019, at 01:59.